I keep lists. Lots of lists, in fact. In fact, I'm probably what could be called a serial lister. 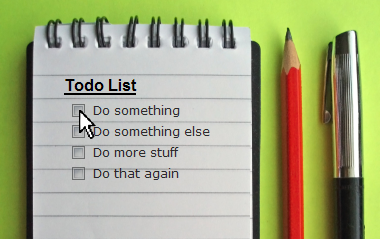 I list the things I want to get done during this working week. I list the ideas that come into my head for future projects. I list the gifts I aim to buy for Christmas presents. I list the shopping I need to buy. I cross reference my lists - checking off on old lists to see if there are items that need bringing forward to my new list. And sometimes I make a list of all the lists I currently have in motion. I have lists in three different notebooks. For different reasons - personal stuff, magazine stuff, training stuff. I toy with combining all three notebooks into one BIG notebook, with everything all combined in ONE BIG LIST. But I think I like individual lists more. I get more pleasure from ticking off a few items from a short list, than ticking off a few items from a great big long list that seems never-ending. Hence I have several lists: I think it'd be depressing to look at my entire list of "things I'd like to get done before I die / make my fortune and don't need to work anymore" and realise that I have only ticked off a few. Four books written and produced this year. - and more planned, both by me and by other authors, which will be published under my new PICA BOOKS publishing name. Took over ownership of the NAHPA magazine and rebuilt a bigger subscriber list in the first four months. Created, developed and delivered new training courses, with more on the way. 28 countries visited in 5 years. Next step: make enough money to move to Spain. That's on a BIG list. So, yes, the bottom line is: my guilty secret is that I love making lists - and then ticking things off on them.